What is special about a kids computer desk? 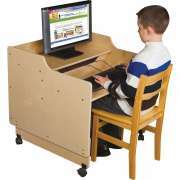 Children’s computer furniture is designed to provide proper support for your students, no matter what age they are. As computers become more and more essential in today’s classrooms, it is important to make sure that your youngest students learn proper ergonomic positioning from the beginning. Appropriately-sized furniture is the first step to ensuring that this happens. Our kids computer furniture is designed to fit in with your other classroom furniture. With natural wood construction and adjustable height, you can enjoy childrens computer desks that look and feel great in your space. These models are perfect for a library media center, computer lab, activity centers and more. Do you need computers in the classroom? Knowing how to use a computer has become an essential life skill for the twenty-first century. Besides the day-to-day necessities, it is also an integral part of various professional fields. Having computers in classrooms helps children develop skills from a young age. They can be used to teach internet research skills, educational games and much more. Even preschoolers can benefit from having a workstation outfitted with childrens computer furniture. Why do you need kids computer desks? Like all people, children need to learn proper positioning in order to stay healthy and productive while working on computers. Because kids are shorter and smaller than adults, they require kids computer desks, rather than full-size tables. If they have to strain to type and read the computer screen while seated at adult desks, children will have negative experiences and likely suffer pain and discomfort as a result of improper positioning. Computer furniture for children has the same ergonomic requirements as it does for adults. What makes a kids computer table ergonomic? There are many aspects involved in promoting proper positioning at a workstation. One important factor in ensuring that a kids computer table promotes healthy posture is the height. Adjustable-height tables are ideal because they allow you to configure the furniture according to the size of your students, with the flexibility to adjust on the spot as needed. A keyboard shelf is another important factor because it keeps hands and elbows properly positioned for typing. How big is a kids computer desk? We have kids computer furniture in a selection of sizes so you can get the right fit for your space. Some models are meant for one computer while others accommodate two. We offer various widths so you can maximize space while providing students with enough room to work. Wheels facilitate smooth mobility and lock in place to ensure secure positioning.